The Little Book of Love, or Petit Livre d’Amour, is an absolutely fascinating, and terribly romantic, illuminated manuscript. Also known as Enigmas of Love, it was a Valentine’s Day gift from Pierre Sala (b. 1457 — d. 1529) to his sweetheart. Sala devised the poems contained within the book. He also was the scribe for this particular project. It is thought that the miniatures contained within the pages of the Little Book of Love were completed by an illuminator known as, “Master of the Chronique Scandaleuse.” The portrait of Sala at the end of the book is attributed to John Perréal. 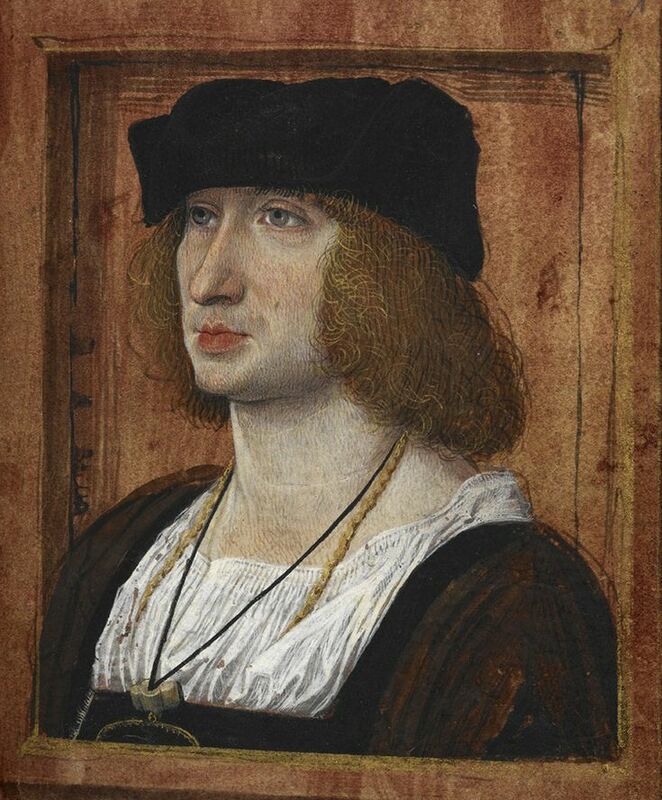 Sala served Louis XII of France in a multitude of offices, including equerry and personal valet. The book was created in around 1500, and its original binding was of pressed leather over wood. Sala gave the book to a woman who would become his wife: Marguerite Bulliod. The book is only about 5 inches by 3.7 inches, and there are links on either side of the book. That way Marguerite could attach the book to her girdle and take it with her throughout the day. The pages are stained a reddish tone, and Sala used gold ink. Sala employs French and Italian, and uses mirror writing at the back of the book. In several spots throughout, Sala plays on his beloved’s name, Marguerite, which means “daisy” in French. Their initials of “M” and “P” are used as decoration on several pages, as well. The first several pages affectionately describe Sala’s relationship with Marguerite. Thereafter, the illuminations begin, with the first showing a man placing his heart inside a daisy. The accompanying text states just that. There are twelve images total. There is another illumination of a man playing blind man’s bluff with three women, and the accompanying text has the man lamenting that he need catch only one of them. 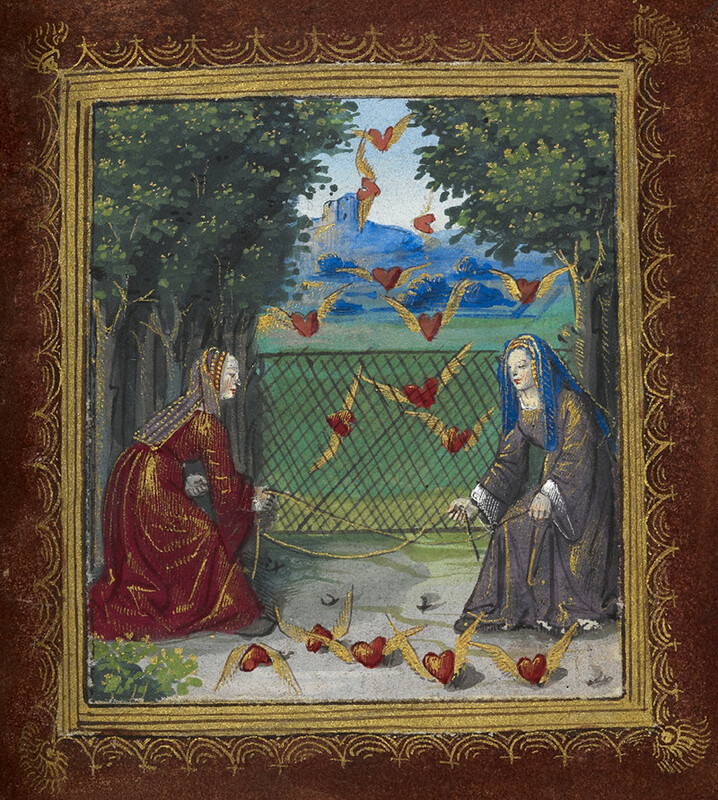 Several more pages in, one finds an image of two women holding a net and catching flying hearts. The accompanying quatrain identifies the allegorical women as Friendly Welcome and Courteous Manner, and they have set about catching fickle hearts. What is most charming in the quatrain is that Sala draws a wee heart instead of writing out the word. A portrait of Sala lies at the back of the book. Marguerite must have found the Little Book lovely, and she became his wife. They were together until Sala’s death in 1529. Sala, Pierre.Little Book of Love: a Facsimile of the Complete Manuscript. Originally created in Paris and France c. 1500, now held by the British Library as Stowe MS 955. Palatino Press: 2014. 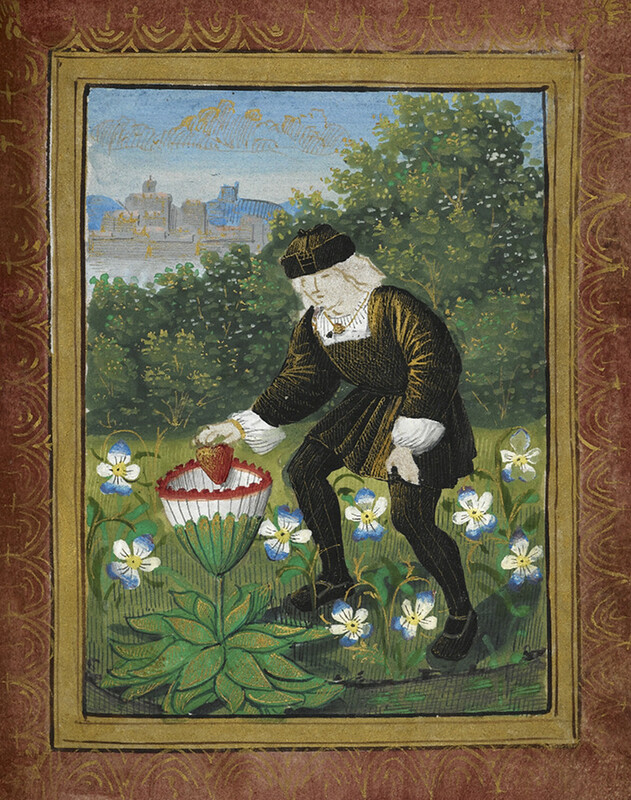 “Be My Valentine.” http://britishlibrary.typepad.co.uk/digitisedmanuscripts/2013/02/be-my-valentine.html Retrieved 18 January 2018. “The Little Book of Love.” https://publicdomainreview.org/collections/the-little-book-of-love/ Retrieved 19 January 2018.